I’ve only been to a few hockey games in my life, but I enjoyed every one of them. My favorite was a game at West Point (I grew up in Connecticut) where after the game the two goalies, last in line to shake hands, threw off their gloves at the same time and started a massive brawl. It was hilarious to see the MP’s (military police) run on the ice in their boots to try to break up the fight – slipping and sliding everywhere. But I digress. 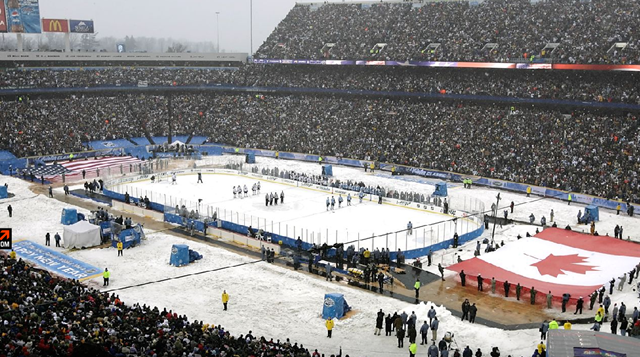 I saw on ESPN.com that the NHL had their second-ever outdoor game today in Buffalo, NY at Ralph Wilson Stadium (home of the NFL’s Buffalo Bills). 71,217 rabid fans in the snow for a hockey game. The rink ran between the 16 yard lines.